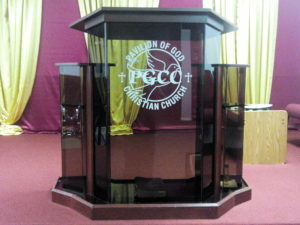 Pavilion of God Christian Church was founded in 2005 by Pastor Joshua Oravbiere, who is the General superintendent of the church. The first Sunday worship was held on July 10, 2005, with a total attendance of 17 adults and 25 children. Christians live constantly in sin, fear, worry, anger, bitterness, sorrow, lack, sickness, broken or turbulent homes, pain, suffering, dishonor of God, and accept all that Satan can offer without power of resistance whatsoever, as if Christ went to the cross in vain. Pavilion of God Christian church believes therefore that if Christians can be brought back into a close and strong relationship with God, by exposing them to the knowledge of the TRUTH (John 8:32; Hosea 4:6), through the teaching of God’s infallible word, the trend will be reversed. They will begin to have resounding victories in all areas of their lives, and enjoy God’s promised ABUNDANT LIFE (John 10:10). The power to overcome lies with God alone (Zechariah 4:6). Daniel 11:32b reads, “…but the people that do know their God shall be strong, and do exploits.” (KJV) The above forms the principle upon which the mission statements of Pavilion of God Christian church is based, as stated below.